There are 8 FIFA Women’s World Cup games left on the 52 game schedule and deltatre digital technology has been behind the TSN and RDS coverage provided to the good people living in tournament host Canada. Their sports tech partnership used an integrated digital platform to deliver video and content of the first games, all the way to the quarterfinals this weekend, through the semi-finals Tuesday and Wednesday, and then the final on Sunday, July 5th, at BC Place Stadium in Vancouver. By using deltatre sport technologies, TSN and RDS allowed fans the ability to follow the live action in real-time, both in English and French, through websites designed and developed by digital sport’s international leader. The Sports Techie community blog is glad to support the 2015 Canadian World Cup as an equal to the billion dollar men’s tournaments, next up in Russia come 2018. Deltatre Delivers TSN and RDS FIFA World Cup Digital Coverage Across Canada. 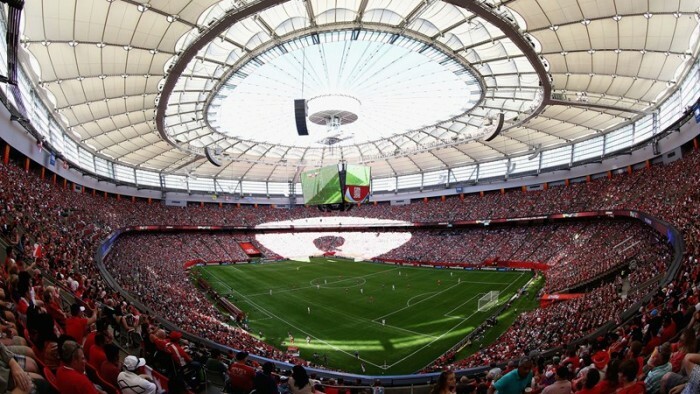 The Canadian spirit and fan enthusiasm was showcased during their Round of 16 match against Switzerland when an average 2.8 million connected fans on CTV, TSN and RDS set a national record for any FIFA World Cup game. “These impressive viewing figures show just how popular the FIFA Women’s World Cup and women’s football are becoming all over the world,” said Niclas Ericson, FIFA’s Director of TV. Next up is Team England on Saturday night so look for the old soccer viewing record to be crushed by the largest Canadian audience to date streaming the intense rivalry game against Great Britain powered by deltatre. Should they go on to the semi-finals and finals, look for the existing viewing record to be continually broken by Canadian digital fan love for Team Canada. Chris Collie, Associate Director, Digital at TSN, said “Choosing deltatre for the digital coverage of the FIFA Women’s World Cup Canada 2015™ felt natural after the work done together on Vancouver 2010 Winter Olympic Games, London 2012 Summer Olympic Games and the UEFA EURO 2012™. Their ability to provide a flawless service even in high-pressure environments is a most valuable asset when dealing with major live events”. Every World Cup game including the quarters, are video streamed live on the soccer.tsn.ca and soccer.rds.ca digital platforms where you can find game-changing and entertaining statistics, analytics, editorial and social media content. The quarter-finals on TSN and RDS begin today with Germany taking on France at Olympic Stadium in Montreal. Next, China PR plays Team USA at Lansdowne Stadium, Ottawa. Tomorrow, Australia matches up with defending champions, Japan at Commonwealth Stadium, Edmonton. Finally, England versus Canada at BC Place in the match everyone in Canada is sure to keep a virtual eye on. Carlo de Marchis, Chief Product Officer at deltatre, said: “When it comes to digital sport, deltatre loves Canada and Canada loves deltatre. During this FIFA Women’s World Cup™, fans are having direct access to the heart of the action, both through seamless video streaming, and through our LiveBlogging tool; one of deltatre’s storytelling platforms that integrates text, pictures, video and social media content. Forge, deltatre’s solution for responsive websites, has been key to designing a smooth user experience and developing the platform in a very short space of time, easily integrating into the TSN/RDS digital ecosystem. We hope to help Canadian audiences enjoy such an important sporting event and we are proud that TSN and RDS put their trust in us once again”. Sports Techie, Canada has been a magnificent World Cup host. This is no surprise as my whole life I have watched NHL regular season games, playoffs and the Stanley Cup via Canadian broadcasters and love it. Most people know Canada loves hockey, but what you may not know is their love for soccer. lacrosse and many other sports. As a kid, my youth soccer team was part of the Canadian exchange program. One weekend during the season, our soccer squad was hosted by a local family around Vancouver. Then another weekend, the Canadian players would come down and spend the weekend in Seattle. I grew up as a teen watching the Seattle Sounders and Vancouver Whitecaps play epic matches in the NASL as they do now in the MLS. So I already have a impending sense of what is happening in Canada in terms of grassroots, corporate and social support for Team Canada. Just like the Winter Olympics or a Stanley Cup final series, the World Cup event could not be in a better host country than Canada. While FIFA has taken a major hit as a brand because of recent scandals and the resignation by President, Sepp Blatter, the Women’s World Cup is fast becoming more and more popular to watch all around the globe. FIFA said China PR’s win over Cameroon presented on CCTV captured five million fans during the Round of 16. Fans watched Team France defeat the Korea Republic over French broadcaster W9. A new record of 2.8 million average French fans watched the match on W9 providing a channel audience record and a much larger fan viewership tally then occurred in 2011. FIFA’s support of worldwide broadcasters like TSN, RDS and deltatre, their investment in broadcast production and the technology driven connection with happy football fans using televisions, mobile devices and computers feeds to watch the action, have a second screen experience while rooting on their favorite women national teams and players, are all solid reasons why #WWC15 is the summer place to be at or watching. Watch live World Cup action in English at WWC on TSN and in French, here.